We propose a telepresence system with a real human face-shaped screen. 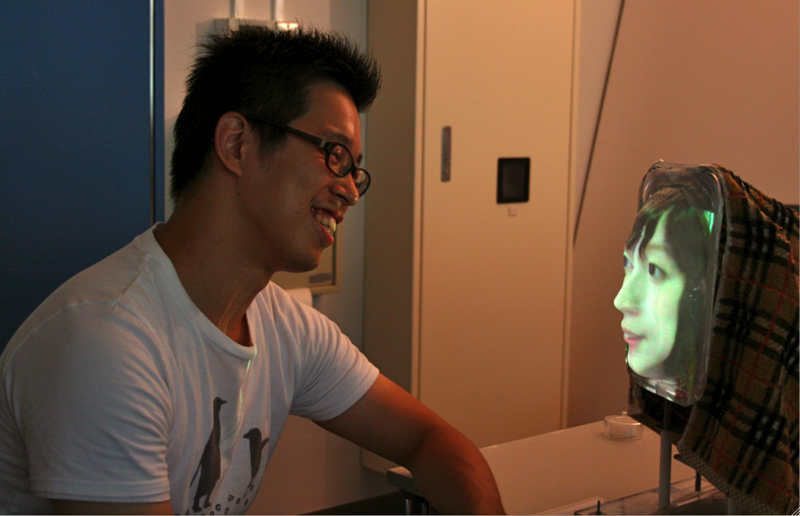 This system tracks the remote user’s face and extracts the head motion and the face image. The face-shaped screen moves along three degree-of-freedom (DOF) by reflecting the user’s head gestures. As the face-shaped screen is molded based on the 3D-shape scan data of the user, the projected image is accurate even when it is seen from different angles. We expect this system can accurately convey the user’s non-verbal communication, in particular the user’s gaze direction in the 3D space that is not correctly transmitted by using a 2D screen (which is known as “ the Mona Lisa effect ”). We found that the recognizable angles of the face-shaped screen were bigger, and the recognition of the head directions was better than those of the flat 2D screen. More importantly, we also found the face-shaped screen could accurately convey the gaze directions and it solves the Mona Lisa effect problem. Ma petite chérie is a telepresence system with a reduced scale face-shaped display for supporting intimate telecommunication. 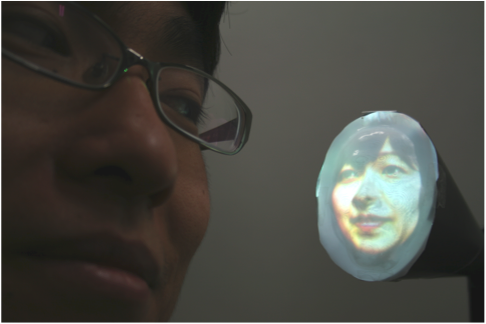 In our previous work, we have developed a real-size face shaped display that tracks and reproduces the remote user’s head motion and face image. It can convey user’s nonverbal information such as facial expression and gaze awareness. We expect small size face displays retain the benefit of real-size talking-head type telecommunication systems, and also provide more intimate impression. It is easier to transport or put on a desk, and it can be worn on the shoulder of the local participants so that people bring it like a small buddy. However, it is not clear how such reduced-size face screen might change the quality of nonverbal communication. We thus conducted an experiment using a 1/14 scale face display, and found critical nonverbal information, such as gaze-direction, is still correctly transmitted even when face size is reduced. Kana Misawa, Yoshio Ishiguro and Jun Rekimoto, Ma petite chérie : What are you looking at? A Small Telepresence System to Support Remote Collaborative Work for Intimate Communication, The 3rd International Conference on Augmented Human (AH 2012), Megeve, France, 2012.